Do you need a fuel day tank in your fuel supply system? When Is A Fuel Day Tank Needed? Perform some basic piping calculations. This is the easiest step. In a nutshell, if the engine-mounted fuel pump is unable to draw fuel from the fuel source (fuel storage tank), a day tank in close proximity to the engine is required. Next step, how do you determine the engine’s capacity to draw fuel from a remote fuel tank? Ask your engine/generator vendor for help if you are unable to locate these values. Once you have the necessary data, you are ready to complete the final step – calculate the expected supply and return pipe restrictions. These calculations should be performed by a plumbing or mechanical engineer familiar with the fuel piping layout. Calculations should take into account the piping length, the pipe diameter, existence of any elbows, valves (including foot valves), and the viscosity characteristics of the #2 diesel fuel flowing through the piping. A quick comparison of the total restriction of the piping system against the limits of the engine should tell you whether a day tank is required for your project. I recommend a freestanding day tank if the fuel storage capacity is relatively small (<600 gallons). Why? Mainly because of the low cost and the simplicity of design and installation. At less than 600 gallons, a subbase tank would be a more expensive proposition. Beyond the cost of the sub-base tank, you would need a fuel fill pump and possibly also an overflow return pump. These pumps might need to be in a separate skid or enclosure (instead of top-mounted as in the case of a freestanding day tank). A freestanding day tank is of standard design, factory-packaged and tested, with all solenoid valves, hand pump, strainer, bypass valves, etc., pre-piped and pre-wired to a UL508 control panel. You can expect a higher level of reliability and lower cost in a freestanding day tank package. On the other hand, I would select a sub-base tank design when it needs to store a substantial amount of fuel (500+ gallons). 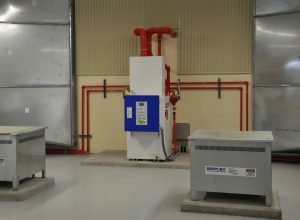 Sub-base tanks make the most sense when they can provide a fairly-large fuel storage solution within the footprint of the emergency generator. Did you find this article useful? Please comment below or post a question. If you would you more information on day tanks, head over here for some guidelines on how to specify a day tank. Yes, you can design a remote cooling system for an ATACAC engine. Stephen, I recommend that the supply pump be sized to 3-times the expected fuel consumption (ie: if the engine or boiler draws 60GPH, pump should be sized to 180GPH). The height of the day tank should be such that the engine/boiler remains capable of returning excess fuel to the day tank. A general rule of thumb is to keep the day tank fuel level below the level of the engine’s fuel injectors. Thanks for your question. Thanks for your question Assad. I am not very familiar with the Webster pumps but these specifications on the “R Series” refer to discharge pressures reaching 100psi. If your pump is of similar design, it should be capable of overcoming the 10psi static head. To be sure, I suggest reaching out to the manufacturer with the specific pump part number. Good luck!